We enjoyed one of our favorite hikes yesterday (though I'm moving a bit stiffly this morning!). 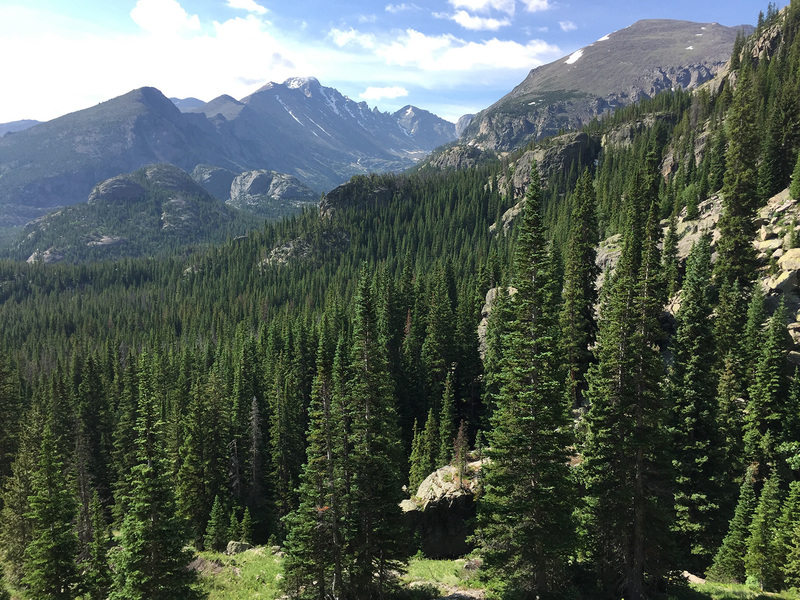 The hike is an eleven-mile circuit (including spurs to the lakes) that starts at the Bear Lake Trailhead and takes us to a half dozen montane and subalpine lakes nestled in the high valleys (9,500 - 10,200 feet) between peaks of the Continental Divide. When we left home early in the morning, the skies were socked in with clouds and mist, and the forecast called for afternoon thunderstorms. This promised cooler hiking temperatures, which is nice at the height of summer, but also meant it likely wouldn't be as photogenic a day as we often enjoy up in the mountains, so I left my camera and gear at home. The upside of this was that my pack was a couple pounds lighter, which makes a difference to me on a hike like this. When we reached the trailhead at 9,475 feet, however, the cloud cover began to break up, and by the time we reached the first lake, we were enjoying lots of sunshine. Then something quite extraordinary happened. Though storm clouds formed and roiled overhead all day long and we even heard some thunder and experienced a very light rainfall later in the day, just as we reached each lake, the cloud cover broke up enough that we could sit lakeside bathed in sunshine. Fortunately, I had my phone with me, so was still able to capture some memories of this wonderful day. Here, we've just reached the rock outcropping above Nymph Lake (9,700 feet), which is the first place the view really opens up (Nymph Lake lies out of frame below and to the left). Off in the distance, center frame, is Longs Peak (14,259 feet) and the formation known as the Keyboard of the Winds on its northern flank. Mills Lake, the final lake in this tour, lies in the valley visible beneath that, though the lake isn't in view in this shot (it becomes visible when the trail gets up around 10,000 feet). Because of the volatility of the weather, we weren't sure we'd get that far, but we hoped we would.